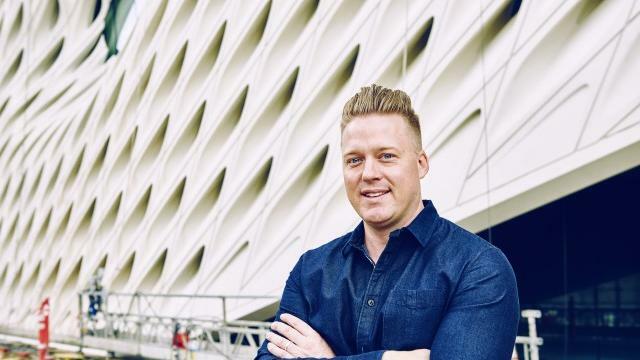 Meet chef Tim Hollingsworth, The French Laundry alum helming Otium, the restaurant at The Broad contemporary art museum in downtown L.A. When art collectors Eli and Edyth Broad decided to build a contemporary-art museum, they picked a site smack in the middle of downtown’s already simmering cultural scene. Then they turned up the gas, recruiting Tim Hollingsworth, former chef de cuisine at The French Laundry, to run its restaurant, Otium. It and the museum are both set to open September 20, which also happens to be five days after the chef’s first child is due. We checked in with him before things got really busy. Here you’ll have a more varied crowd than in Napa Valley. What’s the plan? The idea is a family-style restaurant, for people to share—to create that same kind of interaction that I had as a child. You sit down at a dinner table with your family and say, “Pass me the potatoes,” and you’re all talking.Won’t some want a taste of The French Laundry? I know that expectation is going to be there, so it’s, How do I achieve that in a more casual environment? I want someone to be able to come in and have a roast chicken and a beer, or an elaborate meal that’s exciting and innovative. It’s creating the balance between the two. We’ll be doing savory, seasonal tarts, and one might have black-cherry marmalade, burrata cheese, tomatoes, basil, caramelized onions. The flavors are all very recognizable—it’s not crazy innovative, but the way it’ll be presented … it kind of is. If Eli Broad said, “This year, we’re going to pay you in art instead of cash,” what would you ask for? Jackson Pollock. I’m not sure any of his work is in the collection, though! I think it’s the way that he combines colors, lines, and the rhythm-without-being- a-rhythm in a painting. I associate it with what I do, combining colors and plating and sauces and how things actually touch a plate and how that plate gets presented to a guest. I’m nowhere near being Jackson Pollock, but he’s definitely somebody I’ve been inspired by. Been checking out restaurants at other museums? Um, no. For me, it’s important to be a freestanding restaurant, even though I’m associated with the museum. It goes back to Mr. Broad’s vision: how to get different demographics of people to the area, a crosspollination of all different walks of life. If we can do that, I’ll really be happy, and I’ll consider it a true success.